These hot, crispy little bites boast a rich creamy filling with a hint of crab. 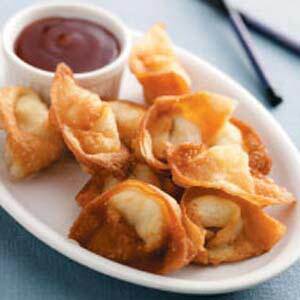 Serve wontons with plum sauce or sweet-and-sour sauce for dipping. In a small bowl, combine the cream cheese, crab and onion. Place 1 rounded teaspoonful in the center of each wonton wrapper. Moisten wrapper edges with water; fold in half lengthwise and press firmly to seal. Keeping the filling in the center, again fold wonton wrapper lengthwise. Moisten the top of the short edges with water. Bring the two top edges from opposite sides together, overlapping the edges; press and seal (finished wonton resembles a nurse's hat). In an electric skillet, heat 1 in. of oil to 375°. Fry wontons for 1-2 minutes on each side or until golden brown. Drain on paper towels. Serve warm. Yield: 2 servings.